The life and times of a craft-a-holic. 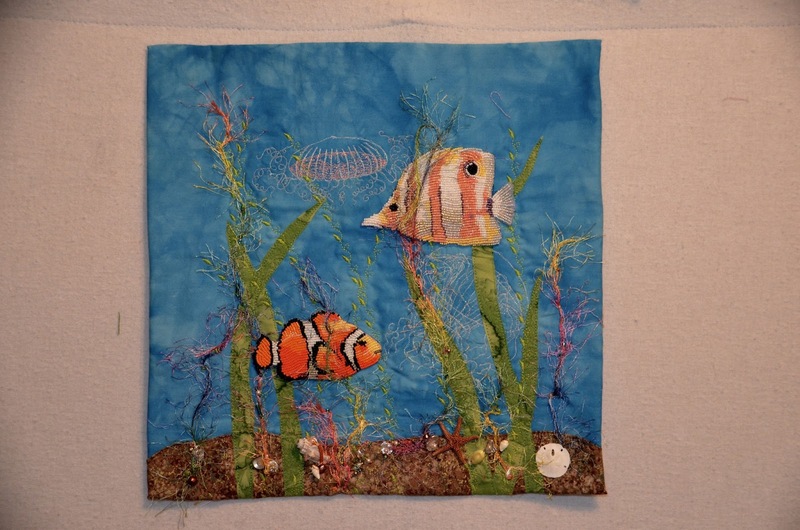 The Sea Fan quilt is now finished. It's 8 x10 and mounted on a canvas. Eventually it will go in a floating frame. If you click on the photo you can enlarge it. I used a real star fish and shells. Also fresh water pearls and seed beads. Okay, I know, it's a stupid name. What can I say, I hate trying to name my work. I'm now incorporating my beading skills with my quilting skills. This piece is 12 x 12 and will be mounted onto a canvas. First, let me say that what was in my head when I started isn't what I got. But I'm still very happy with the finish product. The blue background was hand-dyed by me last summer. I don't generally dye my own fabric, but I took a class and I had a ball. Still, it's not something I plan on getting into. No place in my house to do it anyway. The fish is all hand embroidered onto a backing that is similar to pellon/timtex. Right now I can't think of the name. Lacey something or other. 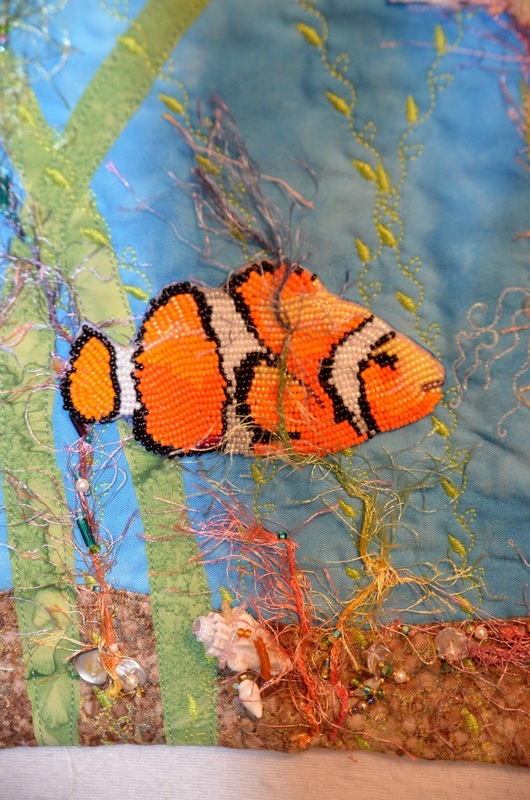 I printed a photo onto it and then proceeded to stitch two beads at a time following the colors of the fish. 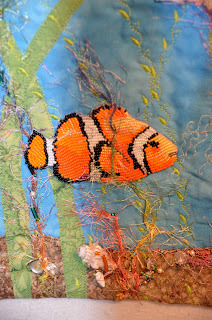 Nemo took 3 days and the other one took 4 days. 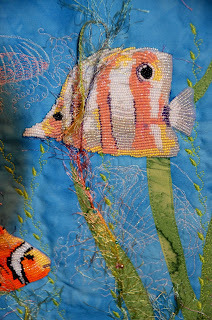 If you look closely you will see that I machined stitched 2 jello fish. To do this I first traced them onto water soluble stablizer and then pinned it to the background and did a free motion stitch. I've added shells, starfish and a sand dollar. All real, along with pearls and assortment of seed beads. 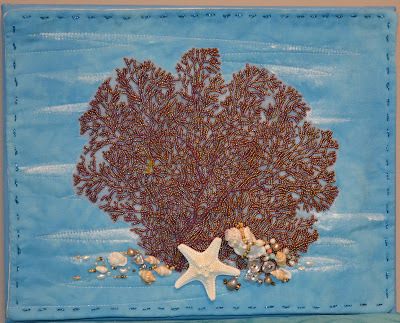 The sea fan from the previous post will go on an 8 x10 quilt and canvas. I will also be adding assortment of shells and pearls. 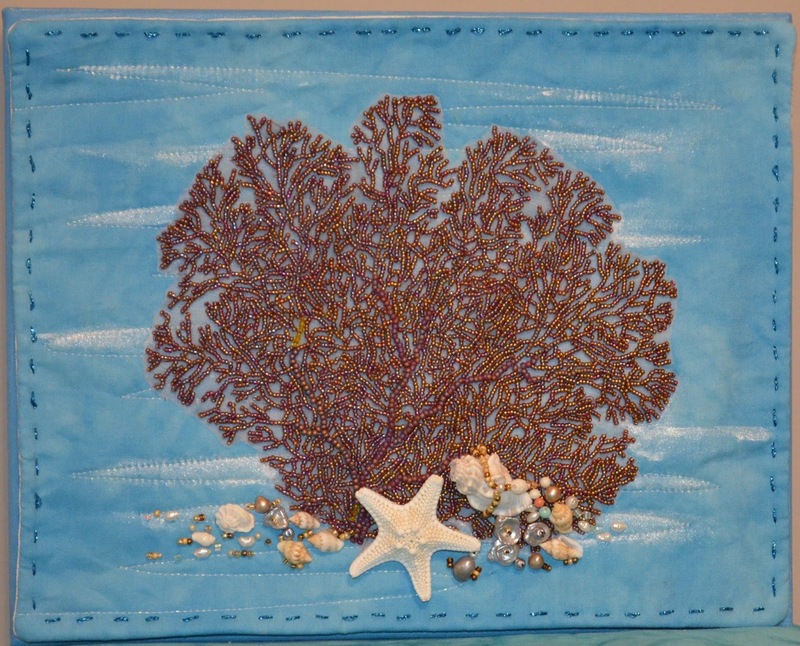 I made a beaded sea fan for a project that I have had fermenting in my head for a while. First, I printed the pattern on organza and than proceeded to bead it with size 15 seed beads. Two beads at a time. It took me 14 days. I photographed it every night when I finished for the day. I thought it would be a neat idea to make a little slideshow of my process. I plan to incorporate this into a quilt which will be a underwater scene with fish and coral. Moving right along with my new MAC. I had a little set back the second day. I feel so embarrassed, but no one told me there was a on/off button in the back. Even when I called the geek squad at BestBuy. Even brought it into the store. The fellow plugged it in and it went on. I asked what did he do. He said nothing. OK. I pack it up, take it home plug it in and nothing. Drove me nuts. At this point I was to tired to fight and gave up for the night. Next morning I call Apple Support. She says "do you hear and sounds when you power up?" I said No! what do you mean power up? I thought I was powering up. She said there's a button on the back of the MAC. OMG! you can't imagine how stupid I felt. I had thought it powered up by pushing the little arrow in the upper right hand corner on the keyboard. That's what I use on my MAC Air. I've have called Apple support on different issues in the past and they have alway given me the best information. I can't say enough good things about them. I live to far to take their free classes, but if you live close enough I highly recommend taking them. Tech support arrived early this morning transferring all my stuff. There are still things I have to figure out yet but I think I can manage. Patience, that's what's in order. So far I'm still in the honeymoon stage. There was software I had to buy, Quicken for one. So while I was on Amazon, I figured what the heck, I ordered Adobe Lightroom also. Next I have to get better surge protectors. It seems the ones I have are not very good. Basically they are just fancy looking power strips. So that's it for my day. I feel like it was an early Christmas. I got so tired of battling with my PC and fed up with having to replace it yet again. So today I bit the bullet and bought a MAC. Best Buy geek square is coming tomorrow to make the transfer. I just picked up the Renaissance quilt from Michael's that I made for a client. OMG! I just love it. It's going to be very hard to hand it over. LOL. Now, I took some photos, but honestly, I don't think they to it justice. First, I had to take it from an angle so that I wouldn't get a flash back. Here is the best of the shots that I took.